Last weekend we had a home visit from a woman and her wee sausage doglet who needed a new home due to changed circumstances. So a popular topic of conversation over the following days was choosing a new name, as her current one was a bit too similar to “Celia”. We went backwards and forwards over an endless stream of names. Anna – too Frozen, Edna – too old fashioned, Helen – too human, Violet – we know someone with a wee girl with this name and so on. The shortlist changed by the hour, then we’d add another name and it changed all over again. Until we finally got it down to about half a dozen names to choose from when she arrived. I’ve no idea how people do this for a baby, when we couldn’t even settle on one for a dog? We finally had the phonecall back yesterday. “Sorry, no”. We weren’t chosen, but then apparently neither was anyone else, they decided as a wider family to keep this wee doglet. They clearly adored her and plan to work around the reasons they were considering a new home. I can’t be sad this time. Not like The never meant to be dog as we hadn’t had a “yes” for this one. So the wait continues for #3, who I just know is out there, and will need us at some point. We will be waiting open our home and our hearts when the time comes. Next time choose “Fred”. But only for a real down to earth bloke type of dog. Or Ralph. I think I will repost my ‘Ralph” poem. You made me think of it, so if it is bad then you can take all the credit. Aww…I know #3 doglet is out there somewhere waiting to come into your home. 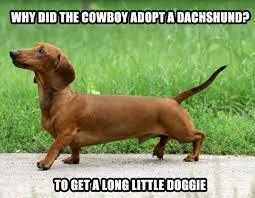 I call my two dachshunds doglets too, and you are the first person I know that does that also! Naming them is hard – I had names picked out, but when both came home, neither would answer to the ones we picked, so they picked their own names 🙂 (Pinot because I was drinking a glass of Pinot Grigio and every time I said Pinot, she looked at me, and Lokie because we just kept calling names out to her, and she consistently responded to Lokie). Thats so cute that they picked their own names! Thats wonderful! 🙂 Such cute names too!